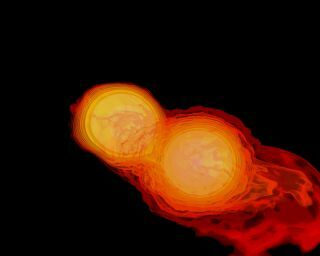 Scene from a NASA animation showing two neutron stars colliding. By looking for ripples in the fabric of space-time, scientists could soon detect "strange stars" — objects made of stuff radically different from the particles that make up ordinary matter, researchers say. The protons and neutrons that make up the nuclei of atoms are made of more basic particles known as quarks. There are six types, or "flavors," of quarks: up, down, top, bottom, charm and strange. Each proton or neutron is made of three quarks: Each proton is composed of two up quarks and one down quark, and each neutron is made of two down quarks and one up quark. One place strange matter could naturally be created is inside neutron stars, the remnants of stars that died in catastrophic explosions known as supernovas. Neutron stars are typically small, with diameters of about 12 miles (19 kilometers) or so, but are so dense that they weigh as much as the sun. A chunk of a neutron star the size of a sugar cube can weigh as much as 100 million tons. Under the extraordinary force of this extreme weight, some of the up and down quarks that make up neutron stars could get converted into strange quarks, leading to strange stars made of strange matter, researchers say. A strange star that occasionally spurts out strange matter could quickly convert a neutron star orbiting it in a binary system into a strange star as well. Prior research suggests that a neutron star that receives a seed of strange matter from a companion strange star could transition to a strange star in just 1 millisecond to 1 second. Now, researchers suggest they could detect strange stars by looking for the stars' gravitational waves — invisible ripples in space-time first proposed by Albert Einstein as part of his theory of general relativity. Gravitational waves are emitted by accelerating masses. Really big gravitational waves are emitted by really big masses, such as pairs of neutron stars merging with one another. Pairs of strange stars should give off gravitational waves that are different from those emitted by pairs of "normal" neutron stars because strange stars should be more compact, researchers said. For instance, a neutron star with a mass one-fifth that of the sun should be more than 18 miles (30 km) in diameter, whereas a strange star of the same mass should be a maximum of 6 miles (10 km) wide. The researchers suggest that events involving strange stars could explain two short gamma-ray bursts — giant explosions lasting less than 2 seconds — seen in deep space in 2005 and 2007. The Laser Interferometer Gravitational-Wave Observatory (LIGO) did not detect gravitational waves from either of these events, dubbed GRB 051103 and GRB 070201. Still, future research could detect strange-star events. Using the Advanced Laser Interferometer Gravitational-Wave Observatory (aLIGO), whose first observing run is scheduled for 2015, the researchers expect to detect about 0.13 mergers per year of neutron stars with strange stars, or about one such merger every eight years. Using the Einstein Telescope currently being designed in the European Union, the scientists eventually expect to detect about 700 such events per year, or about two per day. There may also be a chance that scientists can re-examine LIGO data from GRB 051103 and GRB 070201 to look for signs of strange-star involvement. "The possibility of a re-analysis of LIGO signals for GRB 070201 and GRB 051103, taking into account some possible cases involving strange stars, is really exciting," lead study author Pedro Moraes, an astrophysicist at Brazil's National Institute for Space Research, told Space.com. Moraes and his colleague Oswaldo Miranda detailed their findings in the Nov. 21 issue of the journal Monthly Notices of the Royal Astronomical Society: Letters.